Edit diary: Editing time has been patchy and feels unsatisfactory.Recent days have been full of distractions; catching up with friends, cooking to stock up the freezer, hobbling round with painful muscles after overdoing some exercise, overdue housework to make our home presentable for visitors. 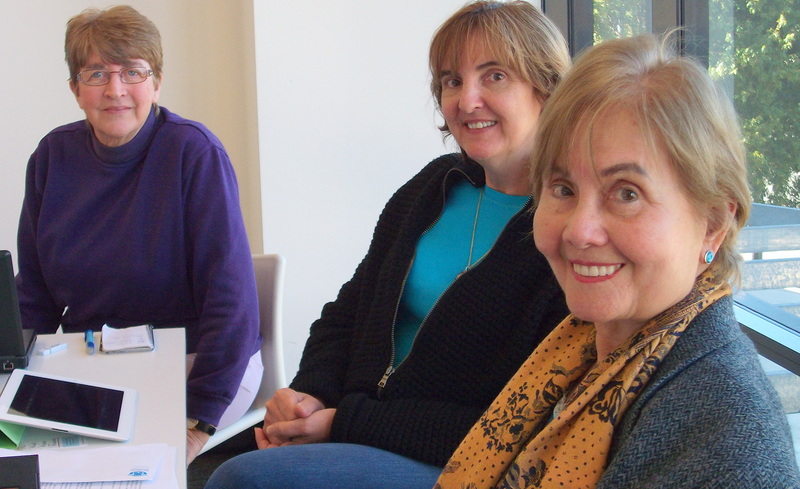 Critiquing: Our Writers Group meeting last Friday (see photos of wonderful colleagues) was excellent with welcome feedback for all who submitted material even though it left some of us with puzzles about conflicting views and suggestions about tackling some plot or character issues. Whilst the perennial suggestions for how to ‘show’ instead of ‘tell’ are a constant at our meetings, there were some stunning examples of ‘showing’ in some passages. And we learn from each other. Short story: In a separate entry, I have great pleasure in introducing a short story Miss Understood by Writers Group colleague and friend, Nene Davies. Reading: Has been disjointed because of constant reference to research resources as I edit my second story Present tense while I have relevant books from the library; to recheck and / or to flesh out information regarding war correspondents and the challenges for aid volunteers in Africa in the late 1990s. Sadly in South Sudan current upheavals seem like a re-run from that time. Even though the political structure has changed, the underlying disputes around resources, ethnic differences, and national and local disagreements persist. Research: Because it is such a joy to read one of the books, Emma’s War, by Deborah Scroggins in a large print library edition I’ve been finding it difficult to set it aside even when I’ve found the reference(s) I need. So good not being distracted and slowed down by struggles with the small lettering in my personal copy. Thankfully most of the other books are easier on the eye. Although the Scroggins timeframe is a little before my story, her book provides a wonderful panorama of the political and aid environments leading up to the later famine years and the increasing unrest that claimed so many lives through violence, malnutrition, starvation and ill health. Médecins Sans Frontières websites claim me for hours at a time, reading of the work of the volunteers and the experiences of the survivors of the turmoil as they seek help in camps for internally displaced persons (IDPs) and refugees. The amazing MSF videos should be compulsory viewing by the whole world. Why aren’t these people (and others like them in many countries) the ones we welcome to Australia? They have no money to help them move between countries and then buy places on leaky boats. Of course the issues are complex for all asylum seekers and many, many have unmet needs. In my novel the volunteers often have to make diabolical choices about who receives priority for medical care because resources are finite. Same with asylum seekers. We can’t take everyone. My preference is for governments to focus on those people in the most dire circumstances with the fewest or no choices. Editing: Moving through the chapters slowly, experiencing the same hiccoughs as previously, but generally satisfied with progress. Short story: In the context of the Locked collection of stories I envisage, the first one is taking shape out of an amorphous conglomerate of ideas. About the experience of a young woman, about a first pregnancy, the story will mirror the inevitable expedition resulting from the unique genetic permutations that take her budding embryo through to the outside world. With a husband absent in a war-torn zone, she immerses herself, not just physically, but more and more emotionally and philosophically into the event. The question is: Can I do the ideas justice? Another novel: Last year when I was travelling alone in Canada I filled some of the empty time spaces between viewing the landscape and being an inevitable eavesdropper on surrounding conversations during a couple of long train journeys, by jotting notes for a story that was hankering to be told. In odd moments this week (almost a year later) I’ve been typing up those handwritten scrawls and fleshing out the tale of an expat who was trying to escape memories of the violence of Northern Ireland in rural Australia. Not sure how it will go, but it seems that just when she was reaching longer spells of peace, a thoughtless prank by a youngster at her workplace revived the memories. But it also directs her energies in another direction. 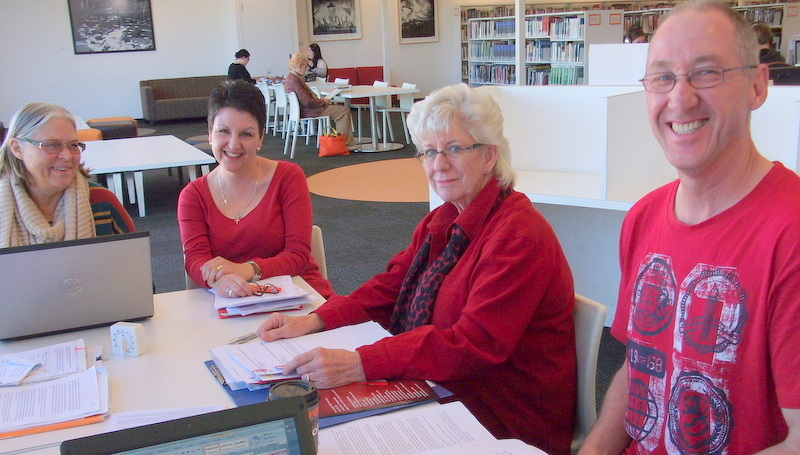 Critiquing: Next Writers Group meeting is in sight so the chapters are dropping in by email clamouring for comments. I’ll make a start over the weekend, first with the ongoing fictionalised biography of Maggie Gard, an aspiring Australian soprano as she explores the mysteries of her teacher’s French castle in the gaps between lessons. The teacher, Emma Calve is most famous for her role in Carmen. I’ll submit part of a late chapter from my own Present hope novel. That section won’t be in my editing sights for quite a few weeks. It’s a challenging multi-person conversation, so input will be most helpful for when I get to that stage. 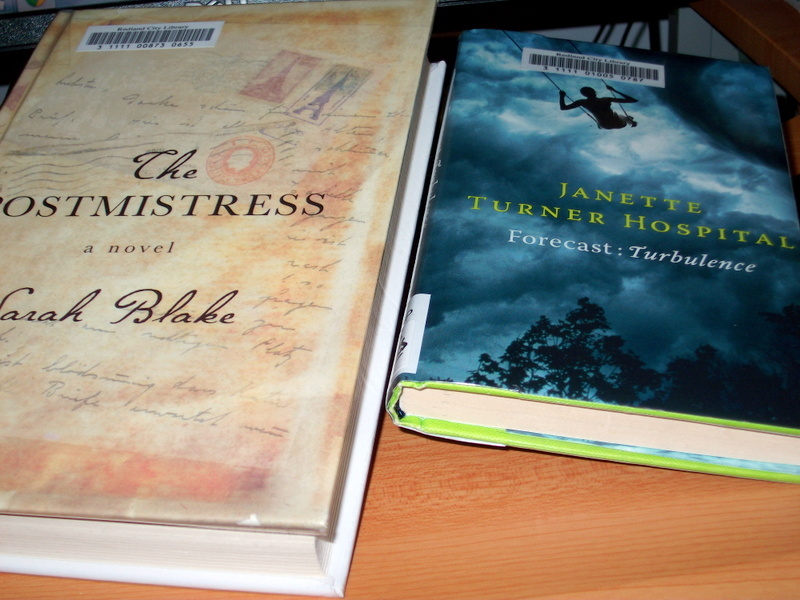 Reading: I’m spoilt for choice at the moment. Will finish the Atkinson yarn tonight – am totally devoid of predictions about the twists, there will be a few more to come for sure. My shelf dedicated to library books is full and I’ve a few favourites from my own collection set aside for re-reading sometime. 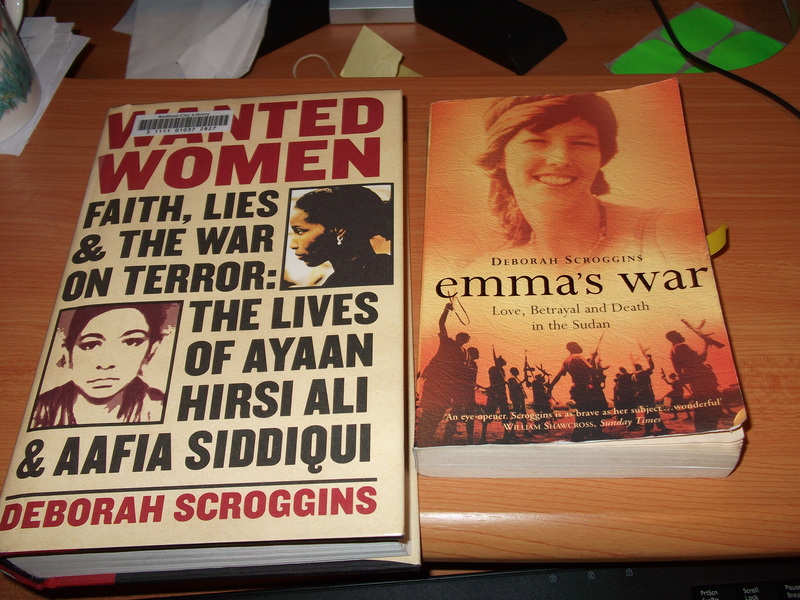 And now I have another choice: Wanted women: faith, lies and the war on terror: the lives of Ayaan Hirsi Ali and Aafia Siddiqui by Deborah Scroggins. What a wonderful coincidence that the author’s name beamed out from a library trolley of new acquisitions just as I was leaving today. I can’t be absolutely sure of the details after a gap of five or six years of thinking about my saga novels and following many lines of research, but I know that Deborah Scroggins had a role in how my story developed after I read her book Emma’s war. It is located in large part in South Sudan and tells the unique story of Emma McClune and her marriage to a local warlord. Some scraps in the book that referred to the work of Medecins Sans Frontier at that time led me on a much wider search, and later on, snippets of the experiences of women like Ayaan Hirsi Ali within Holland, found their way into my story as well. Now I know which will be my first read of choice after Atkinson is done. Weekend: Won’t be able to turn a blind eye to the housework screaming out for attention.